In the state of New South Wales (NSW), on the east coast of Australia, a fishing program was established decades ago with the purpose to protect the public from sharks. The NSW Shark Meshing (Bather Protection) Program began in the late 1930th with the deployment of mesh nets at selected beaches from Palm to Cronulla in the Sydney area. 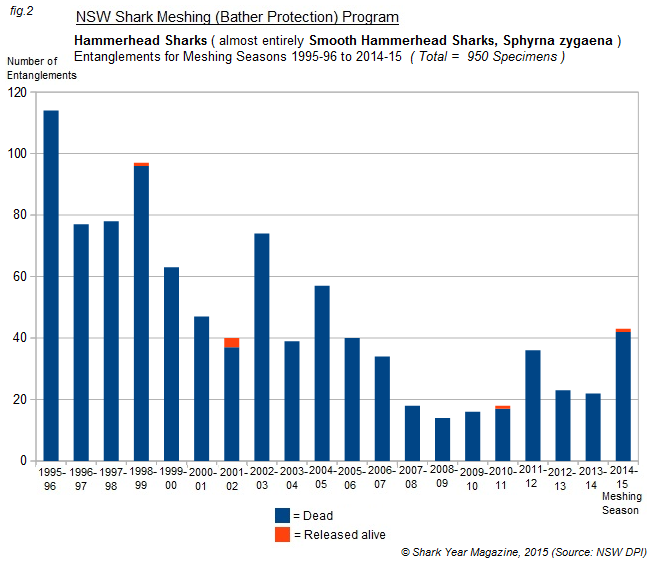 Since then, the shark meshing program has been continuously expanded to other regions along the coast of New South Wales. Today, 51 beaches covering over 200 km of coastline ( from Wollongong in the south, northwards to Newcastle ) are netted by contractors using specially designed meshing nets. The annual meshing season officially begins on 1st September and ends with the removal of the nets on 30th April on the following year. During the eight months of the last meshing season, the entanglements of 94 sharks and 86 rays were registered by the participating contractors. The exact species composition is shown in table 1 below. As seen from figure 3, February was the month with the most marine life interactions reported ( total 48, 30 rays and 18 sharks ). The mesh nets have killed the majority of the 94 sharks with only four individuals being reported as released alive ( one Smooth hammerhead, one Broadnose sevengill, one Bronze whaler and one Bull shark ). In contrast, the mortality rate of rays is much lower with only 19 dead specimens (ca. 22%). Almost half of the shark catches (ca. 44 %) consisted of Smooth hammerhead sharks (Sphyrna zygaena), which is a non-target species in the NSW Shark Meshing Program. The largest Smooth hammerhead shark measured 3,70 metres in length ( fork length, FL). The male specimen died after it became entangled in a net off Terrigal beach, located in the Central Coast region, in late October 2014. The Great white shark (Carcharodon carcharias) was consistently the second-most caught shark species of the 2014-15 season with 10 individuals ( 6 males and 4 females ). All specimens of this target species were just juveniles measuring between 1,51 and 2,50 metres (FL). The catches occurred in the Central Coast Region (5 individuals), Sydney North/South/Central Regions (4 individuals) and Hunter Region (1 individual). 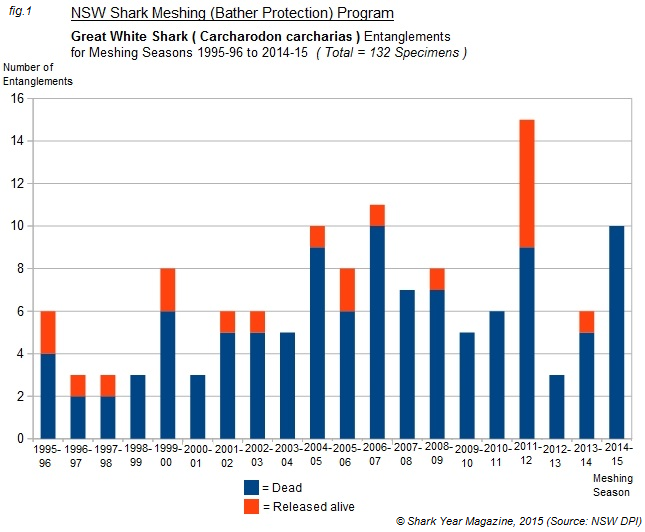 Over the last twenty meshing seasons from 1995-96 to 2014-15, a total of 132 Geat white sharks and 950 Hammerhead sharks (almost entirely Smooth hammerheads, Sphyrna zygaena) were reportedly caught in the NSW Shark Meshing Program ( see fig. 1 and fig. 2 ). 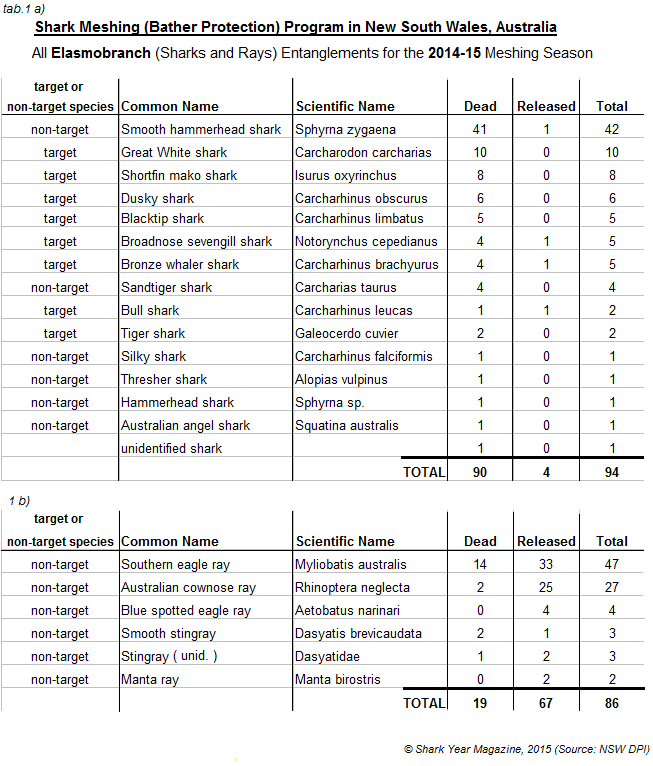 In the Shark Control Program of the neighbouring state of Queensland, Bull and Tiger sharks are downright dominating the catch statistics with several hundred specimens caught each year ( Catch Results 2013 ). Whereas in the Bather Protection Program of New South Wales, only two individuals of each species were netted during the entire last meshing season. The two Tiger sharks ( Galeocerdo cuvier ) were killed in mesh nets off Garie beach, Sydney South region, on the same day in early January 2015. The female specimens measured 2,10 and 2,90 metres in length ( fork-length ). 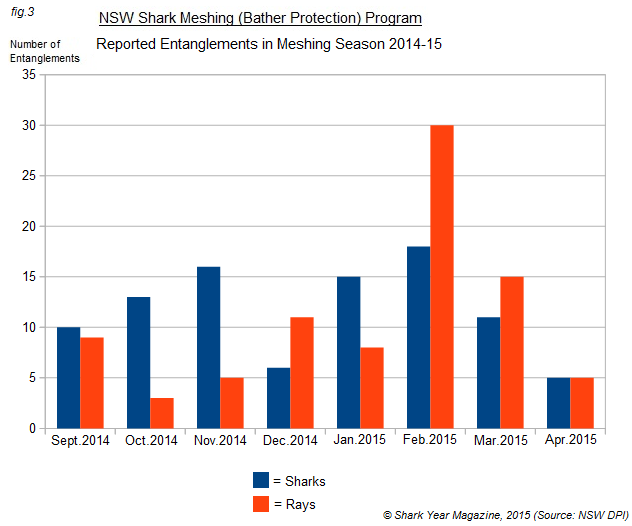 Regarding the two catches of Bull sharks ( Carcharhinus leucas ), both entanglements occurred in mesh nets off two Sydney beaches in February 2015. A 2,30 metres long male specimen died in a mesh net at Bronte beach, while the second bull shark ( 2 metres, male ) was released alive after it became caught at Manly beach. But the largest whaler shark (Carcharhinus species) of the 2014-15 season was a female Dusky shark ( Carcharhinus obscurus ) with a fork-length of 3,50 metres. The catch occurred in the waters near Cronulla, southern Sydney, in March 2015. Interactions with marine mammals and reptiles comprised the following 9 entanglements: three common dolphins (all deceased), four green turtles (three deceased), one dead hawksbill turtle and one released turtle of unidentified species.